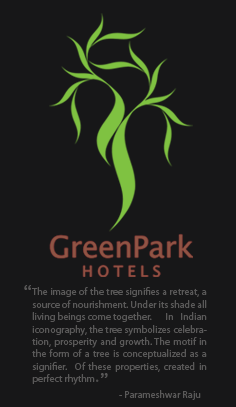 The Greenpark at Hyderabad is an urban oasis located at Greenlands in the heart of the Vibrant Capital of Andhra Pradesh. This elegant and comfortable 148 room hotel is nestled in a one of the verdant areas of Hyderabad. The concepts of sensitivity to nature, efficiency and comfort have been integrated into all facilities and services offered by the Hotel, thereby offering the business traveler a well deserved break and a cocoon to rest and recharge.